Beau Green graduated from Samford University with a business management degree in 2005. He got his first job in the steel industry after talking to a supporter at an away basketball game who offered to provide him an introduction for a job interview. That introduction led to an opportunity for Green to sell steel in the U.S., Canada and Mexico with a Fortune 500 company. 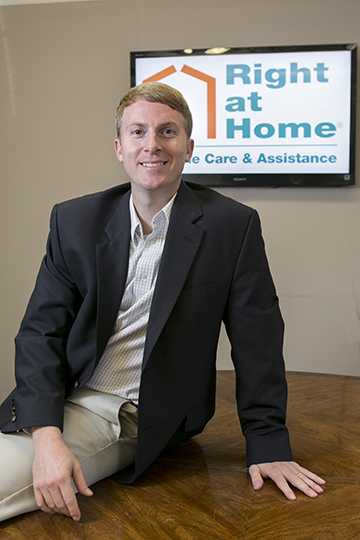 He credits Samford and the faculty at Samford's Brock School of Business for allowing him to explore options and pave his way to eventually starting his own business, Right at Home Healthcare. The decision to open his own business came after he decided he had traveled enough. Green worked in the steel industry and with a technology company for several years. Then he and his wife, Rachel, decided to purchase a Right at Home franchise. At age 30, he was the youngest franchisee of Right at Home. At 32, he opened his second office in Huntsville. Right at Home is an in-home senior caregiver service that tailors care giving to an individual’s personal needs. In its third year, his Birmingham office has achieved President Circle’s status, placing it in the top 10 percent of the more than 400 Right at Home offices nationwide. Green’s advice to students who would like to start their own businesses is to surround yourself with people who will push you. Regularly talk with others in the same stage, but look to mentors for sound advice and direction. When you are able, provide avenues for others or be a mentor. Green and his wife enjoy giving back to Samford, and now he is in a position to help others by applying principles learned in the business school. Editor’s Note: This story appeared originally in the Winter 2015 issue of Seasons magazine.